Pattern Pyramid giveaway to welcome 2014! Your eyes do not deceive you my friends, Karen's Pattern Pyramid which launched on Did you make that? back in June 2012 is still going strong...and you stand a chance of winning! How's that for a 'Happy New Year' wish from me to you?!? I won my loot from the lovely Erin of TwirlDesigns - this wonderful bundle has had quite the journey starting off in London and stopping off in Melbourne, Philadelphia, twice in Seattle, Wellington (NZ), Edinburgh, Montreal, Boston, Berkley (CA) and San Antonio (TX) before reaching me! After I chose a pattern for myself, it still consisted of a substantial 20 patterns ranging from the 1960s, 1970s, 1980s and more recent. All are pictured below, apart from a modern bag pattern which I stupidly forgot to photograph I'm afraid! I then added the below 4 patterns to the mix, meaning there's now a whopping 24 patterns up for grabs! McCall 7583 is from the late 40s / early 50s and McCall's 6328, Vogue 6715 and Pattern Practical 6229 are all from the 1960s. Anyone, anywhere can enter this giveaway, BUT you must have an active blog. The winner gets to pick one pattern to keep for themselves and must then host their own giveaway. Although I don't think Karen directly stipulated this in the first place, it has become customary for winners to add more patterns to the mix...thus prolonging the Pattern Pyramid's lifespan! If you want the chance to become a part of this unique giveaway's history, just leave a comment below by midnight GMT Friday 10 January 2014 and I'll announce the lucky winner on Sunday 12 January 2014. Oh, and in case you're curious as to which pattern I'm keeping for myself, I chose this little beauty! Thank you to the lovely person who contributed Butterick 2304! I'd love to be entered into this pattern pyramid! Thanks. It's getting massive! I'd love to win this - there are a few in there that look interesting to me PLUS I have lots of other patterns to add! What great patterns. I'd love to be entered, thanks! 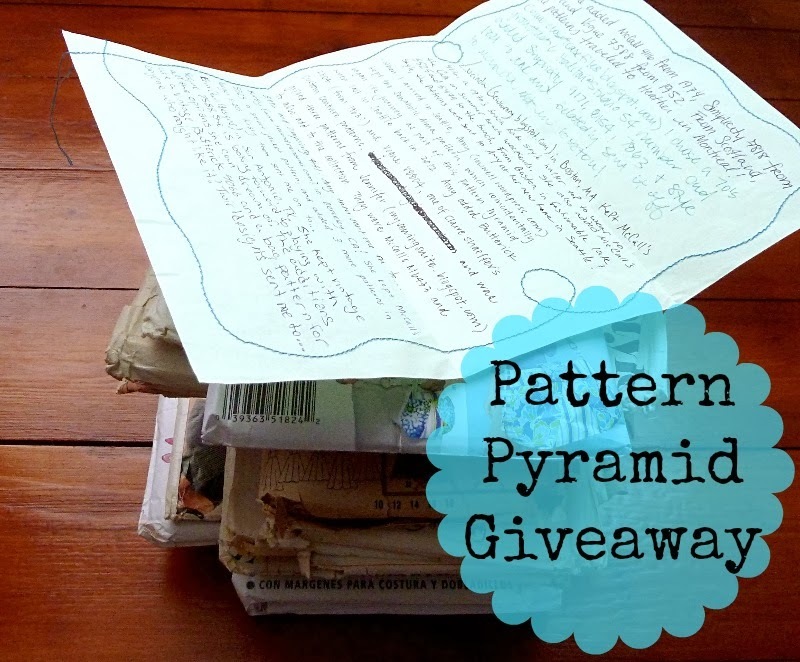 No need to enter me in the giveaway since this Pattern Pyramid has already stopped by my home in Seattle. 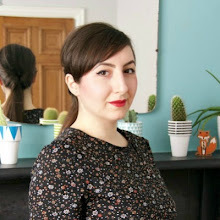 But, I couldn't help but comment since I'm so excited to see that a pattern I added, Butterick 2304, now belongs to you, a favorite sewing blogger of mine! I hope you enjoy your new pattern, and I can't wait to see where the pyramid is headed next! Aaaaw, thanks so much for a) letting me know and b) contributing such a beautiful pattern! I love it and promise to treat it well ;o) I'm also intrigued to see where the Pattern Pyramid will head next! Wow, that's kind of amazing that it's still going round the world! I'd love to enter the giveaway! What a great idea! I would love to enter. Thanks! Put me down... Some nice ones there and I too have stacks to add. 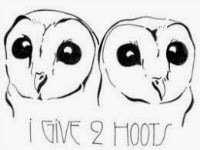 I'd love to enter for the giveway! This is such a fun idea! So awesome! I'd love to be entered in the giveaway. I love this challenge and I love the pattern you chose. It's perfect for the upcoming holiday - Valentine's Day. I'd love to win the pattern loot so please enter me into the contest! Would love to be the next stop! Please don't enter me into the draw, but I had to stop by and say I am STAGGERED and delighted that this is still going. 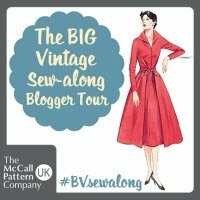 The power of sewing bloggers around the world! What a journey this package has been on. Thanks for blowing on the flames, Marie! Wow! I recognise those patterns :-) so much fun! 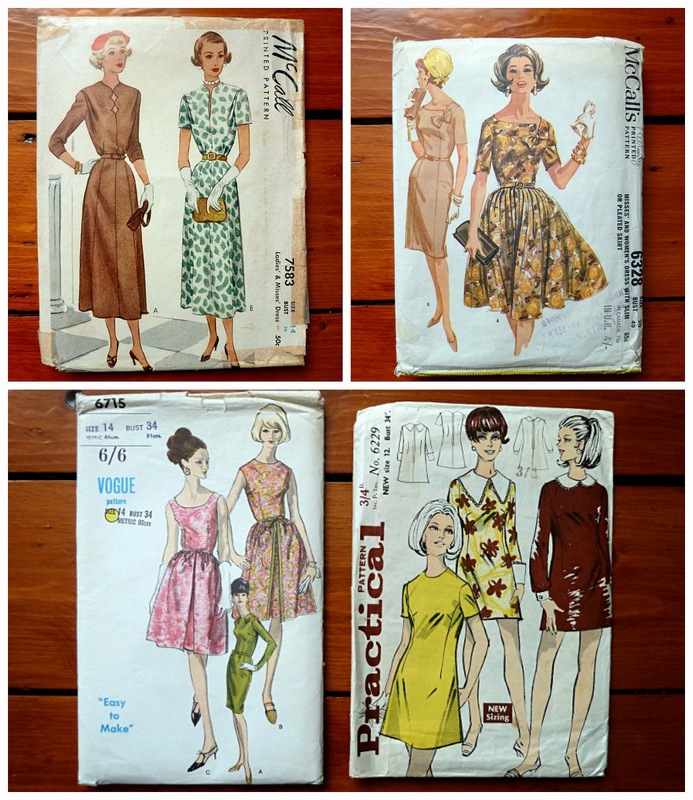 I'd like to be counted in, but if I'd be that lucky to win, I could contribute with magazines only, as my vintage patterns stash is quite small (it only counts a very few pieces). Thanks for the opportunity! I love the Pattern Pyramid! Such a great way to host a giveaway! 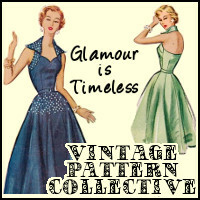 I have some vintage patterns myself I'd love to contribute and the patterns that are already on the stack are amazing! Please count me in! Sounds awesome! This is an amazing pattern pyramid, so many great ones..I am in love with the practical pattern no 6229! Please enter me. Oh my gosh, count me in! There are some beauties in there. Can't believe it is Still going! Can I be entered please? What a fabulous idea! Count me in! Wow! More gorgeous patterns - Please count me in!! So impressed it's still going strong & by the number of responses it doesn't look like it shows any signs of slowing down. I'd love to be a part of it! Wow, so many great patterns! Please count me in! WOW!! I can't believe Karen's original Pattern Pyramid is still going on! That's too cool. I would love to be entered into it. Fingers crossed! Ooh, please count me in. I'd love to be part of this amazing pattern pyramid. What a wonderful giveway. Thanks, I'm in! Please count me in, its amazing that this pyramid is still going! Count me in! 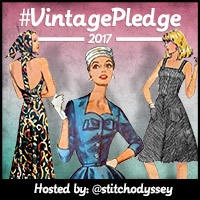 I'd love to sew one up and contribute some of my un-used patterns! Ooh, how exciting! Count me in :) There are some gorgeous patterns there! I was thinking about the pattern pyramids yesterday and wondered if any still existed. Please count me in.